Bread, Who doesn’t eat bread every once in a while? Most people do unless you have some gluten problems. What I find hard to grasp though, is why people like the Bread that is sold in the Supermarkets so much. Its is so light, so Airy, not to much taste. Eating a slice of supermarket bread doesn’t fill me up at all. Besides, did you ever had a good look at the ingredients? hmm. 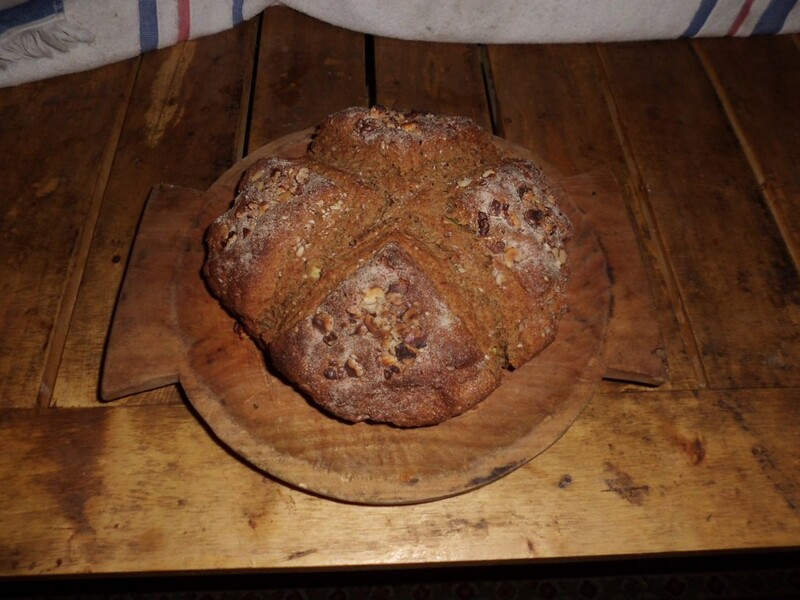 In Ireland this winter, I was taught how to make Soda Bread. These days I bake my own version of this recipe about twice a week, for the obvious reasons. Hopefully after you have read this post, I have inspired you to do the same! Evidence suggest that the first Breads were made over 30.000 years ago. 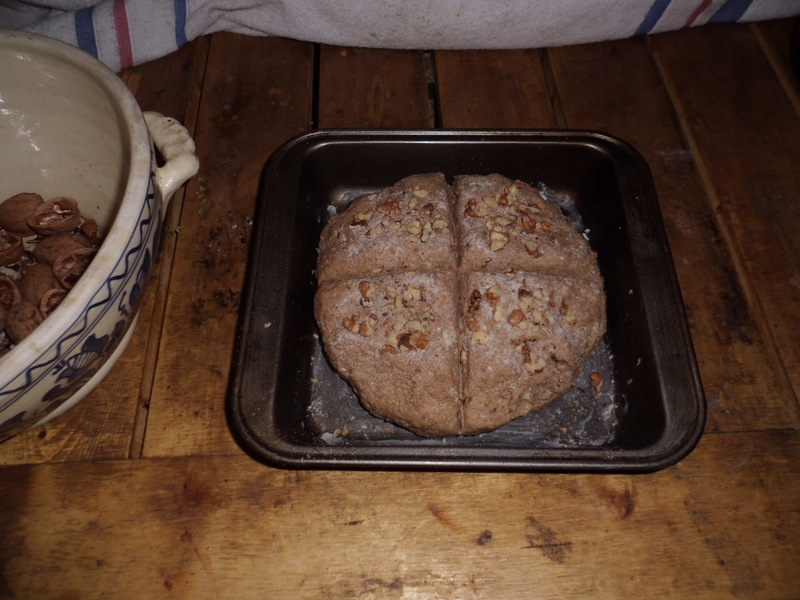 These were not the Breads as we know today, Rather they were a flat kind of pancake, a grain-paste cooked on a flat stone above a fire, made from roasted and ground grains and water. Probably found out either by accident or by deliberately experimenting. These days we know these Breads as Tortillas or Roti sheets. Around 10,000 years ago, when wheat and barley slowly were being domesticated. Wheat-based agriculture spread from Southwest Asia to Europe, North Africa and the Indian Subcontinent. with the finding of Gist/Yeast and other edible crops. Humans slowly changed from the Traditional nomadic, Hunter/gatherer lifestyle to Farmers and settlers. For generations, white Bread was preferred by the rich while the poor ate dark (whole grain) Bread. It was not until the late 20th century this changed in Western society. 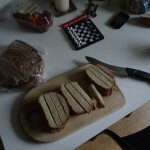 Whole grain bread became preferred due to having better nutritional value, while white bread became associated with lower-class ignorance of nutrition. While Soda Bread as we know it today has been fine tuned by the Irish. They were not the first to use Soda as a leavening agent. It was actually the Indigenous people of America that knew about the chemistry behind the process for a long time. They used to make Potash (the ancestor of Baking soda). Potash was made by mixing wood ashes with water, which afterwards was evaporated in Iron pots. leaving behind a white residue called Potassium Carbonate. which they then used in their bread to make it rise. Just kidding! Before we continue I would like to say that this is not the Traditional recipe, I kind of modified it to my personal preferences after experimenting a bit. Some say the term “Soda Bread” is restricted only to the white traditional form. Ah well, Everything is a Remix. Flour of choice, I like Rye flour. About a hand full of seeds. 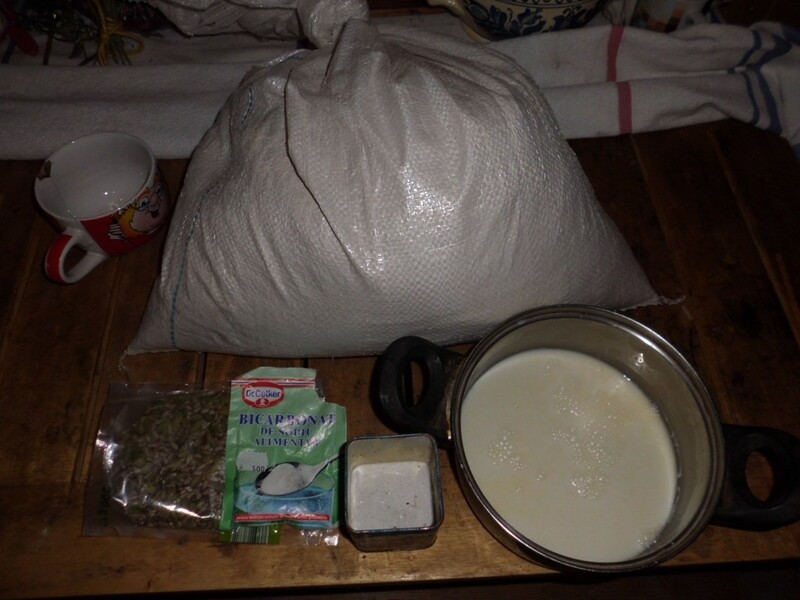 The day before I want to bake the Soda Bread, I get a bottle of Fresh milk from our neighbors who have a Cow. 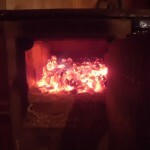 We use a Wood Fired stove to cook and to heat the house. 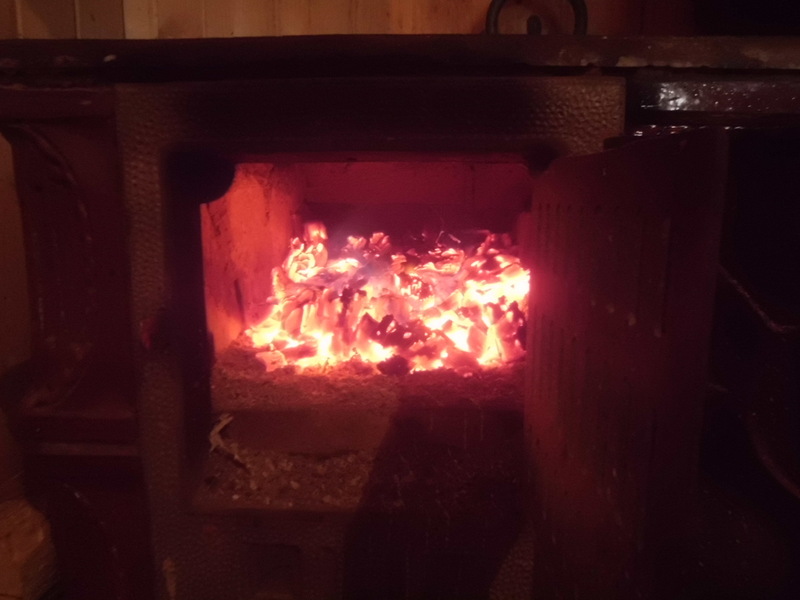 I put one cup of milk in a pan which I leave on top of the stove over night (not directly onto the cooking pit) but on top of the thermal mass. The next morning the Milk has turned a bit sour with a layer of cream on top of it. Before I start the bread I mix the cream through the milk, now its ready to use. Of course, if you live in the City and don’t have access to fresh milk. Feel free to buy Sour milk/Buttermilk or maybe Kefir at your local shop. Why use Sour milk? Well, Sour milk contains Lactic Acids, Baking Soda reacts with these acids to make tiny bubbles of Carbon Dioxide. This causes the Dough to rise which gives it, its typical texture. Pre-heat your oven to 190 Degrees. 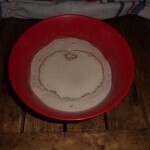 Put two cups of your chosen Flour in a bowl, I use quite a big cup, not the regular teacup. Add a tea spoon of Salt and Soda. then the hand full of seeds. 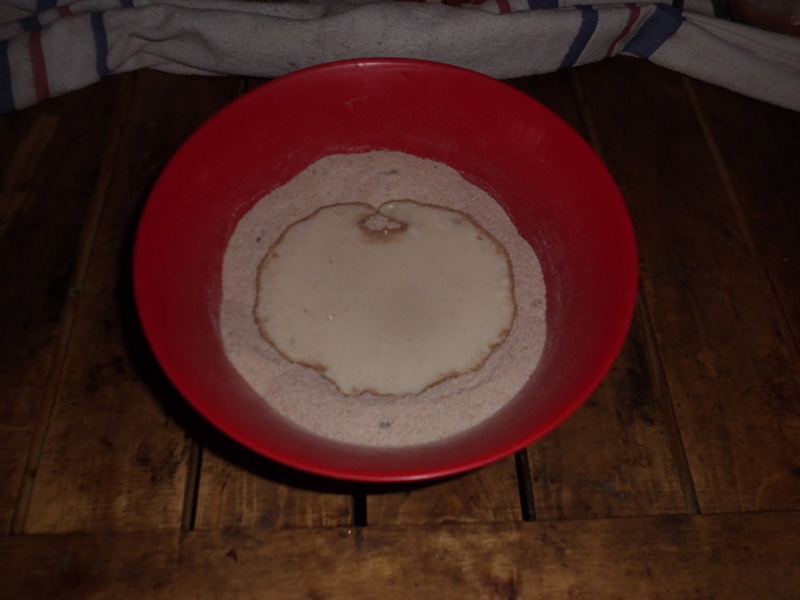 Mix this up a little, for the Soda, Salt and seeds to evenly distributed through the flour. Put it in the oven for about 40 minutes. 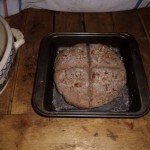 To check if your Soda Bread is done. Poke it with a knife or similar tool, if no dough is sticking to the knife the Soda Bread is Done! Look at dat Soda Bread. 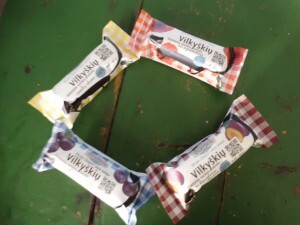 So compact, So Tasty! Omnomnom! I like the bread heavy and compact. But if you like it a bit more airy you can mix an egg through the Sour milk. Some people also like it to add a spoon of Honey to the Sour milk. This will balance out the slight sour taste the bread can have. Or do you prefer it Vegan? Instead of the sour milk, you could consider buying a Coconut and make Coconut milk, or make a milk from Hemp seeds. Any other nut or seed should be fine too, though Coconut is great for it already has a nice fat content that works good with the bread. The only thing you have to add manually is the acid, The acid is needed for the Reaction with the baking soda, so simply add a teaspoon of Lemon juice or Vinegar to the milk you made. let is sit for about 5 minutes before you use it instead of the Sour milk. Try different things, at some point you will find your own preferred combination! Happy Baking! 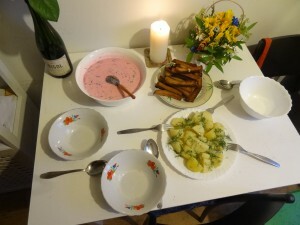 So Saturday night we made some Traditional Lithuanian dishes, don’t expect anything crazy, dem Dishes are so EZ its like, how can something so delicious be so simple to create. well, I will try to give you an idea! 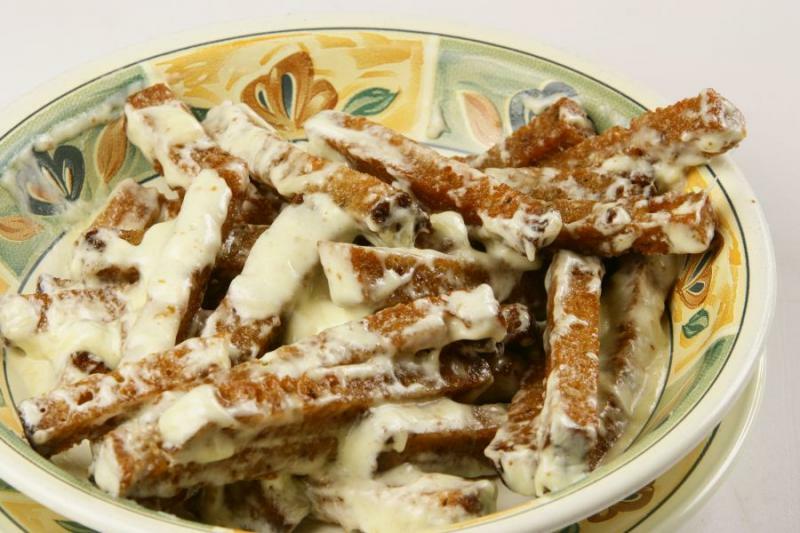 Its my favorite snack since I Arrived in Lietuva, for making diz deliciousness at home, all you need is some bread (old rye bread would be recommended) some Garlic and something to make a cheesy saucze with! When you fried all your delicious slices O Breadz, its time to Garlic them. the technique to do this is probably different in bars then how we used to do it. but they showed me a very simple way, Get your Garlic, grab yo bread. and rub the garlic over both sides. simple as that, then chop some garlics in little peaces and throw them over. Double Garlic all the way! Our cheese saucze failed pretty bad! (not the taste but the substance) but I think the easiest way to do this is to throw over the bread some Grinded cheese then put in into the oven until it melts. Now U Haz Kepta Duona!!! Šaltibarščiai is probably even more easy to make compared to Kepta Duona, due to no frying and risk of burning it, you just gather your ingredients. cut them up. throw them in and da bowl and its ready to go! All you need is a vew eggs(cooked) Beetroot, Cucumber, Dille and Kefir. 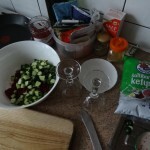 Step one is to cook the eggs then cut the Eggs, Cucumber and Beetroot into peaces and add them to the bowl. when this is done Add the Kefir to the bowl and stir it up! Yeah darling! 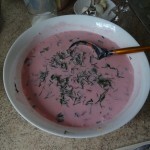 Due to the beetroot the Kefir will get this pinkish color, which gives the familiar Šaltibarščiai look! 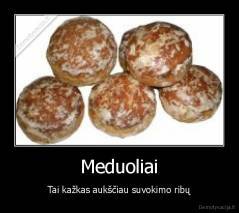 to finish the Šaltibarščiai sprinkle some Dille over it, you can either leave it there or stir it through. if you wanna make this dish as a Real Lithuanian. 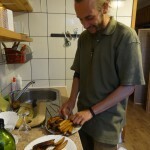 cook some potatoes and serve them next to the Šaltibarščiai as a side dish. 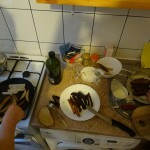 Da result, Delicious Lithuanian foodzies for 3! 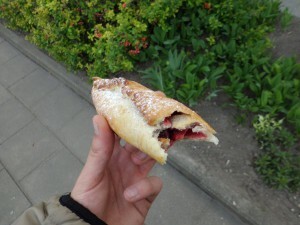 Most of you probably already know about the Delicious Trakai breadz snackz. I found these new amazing Snackz!! Om Nom Nom!! Deze shizz is de Bom! curiouse how Kepta duona is made? whenever I find new amazing snacks I will share fo sho!! Something is wrong with you!